Carbon propellers for Rotax and other engines from 25 to 150 hp. Available diameters are 1250, 1400, 1600, 1700, 1750, 1820, 1860 mm. Blades type could be straight or saber. Has a stainless steel protection. More than 1000 hours of resource. Please feel free to ask me any questions - consultations are free. Selling propellers resettable step. Composite blades, straight and sword, the blade is protected by stainless steel. The diameters of from 1250 to 1860 mm. Designed for Rotax engines and others from 30 to 150 hp Low noise, the incredible power in all flight modes. There fairings and costs € 80. Photos and prices can be found here: http://propeller.simplesite.com/419391464 My advice for free, so please do not hesitate to email me! 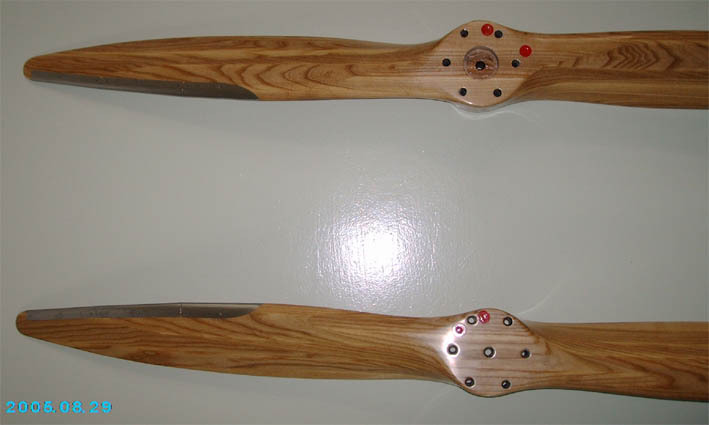 Two-bladed wooden (beech) propeller without protection is 200 €, with steel protection - 240 €. The diameter of 1540 mm. If a plane with a low speed flight, the diameter can be slightly increased, but at the same price increase. This propeller is designed to Jabiru. Merci pour vos aimables paroles. Je suis très heureux de les entendre. Je ai essayé. Meglin, it would be better if you posted the English version too. Google Translate is not good for understanding technical subtleties. Hi Vladimir, one thing you should know is that blade translates "pale" for a propeller. Apart from that, I wish you a Merry Xmas and success for your company. I'm used to it, I thought that the way it should .